One of Savvy Gardening’s favorite topics is the idea of planting edibles in your ornamental garden and vice versa. We like to call this concept Garden BFFs. Tara and Niki have even given talks on the subject, including at Canada Blooms. It’s not a new idea, as gardeners have been combining food and flowers in their gardens for years. There are also some fantastic books available on the subject, including Charlie Nardozzi’s Foodscaping (Cool Springs Press, 2015). Edibles, particularly, those with eye-catching foliage, flowers, or fruits, can be incorporated into perennial gardens, flower beds or container gardens alongside traditional ornamental plants. This sneaky technique allows you to grow more food without digging up new gardens and adds layers of interest to your landscape. We even like to edge our flower and shrub beds with red (or mixed) lettuces, curly parsley, red-veined sorrel, bush basil, ‘Peppermint’ swiss chard, and other low-growing veggies and herbs. Including flowers in your food garden is also a good idea. Not only does it look fabulous, it will attract beneficial and pollinating insects, boosting yield and helping to reduce insect pests. Certain flowers—marigolds, lavender, nasturtiums and petunias, for example—can even deter pests from your veggies or act as a trap crop, preventing pests like aphids, from reaching aphid-prone edibles like peppers. To inspire you, we thought we’d share a few of our favourite combinations. 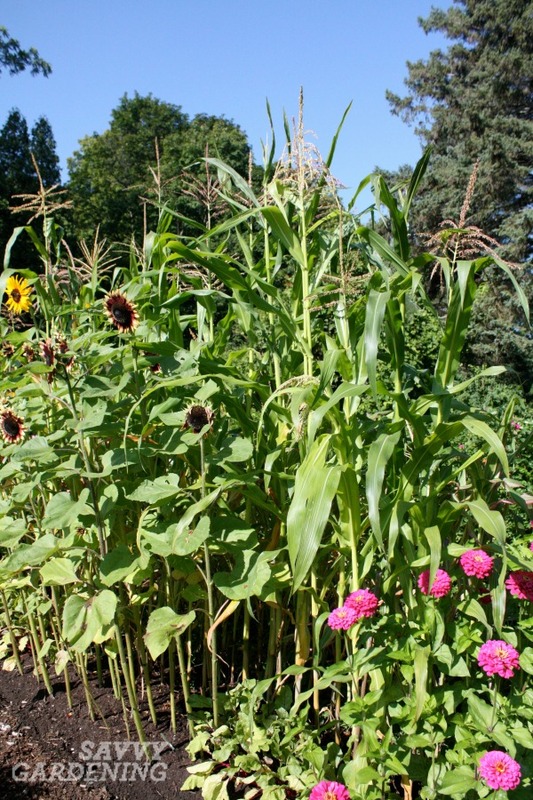 Jazz up your corn patch with sunflowers and zinnias! 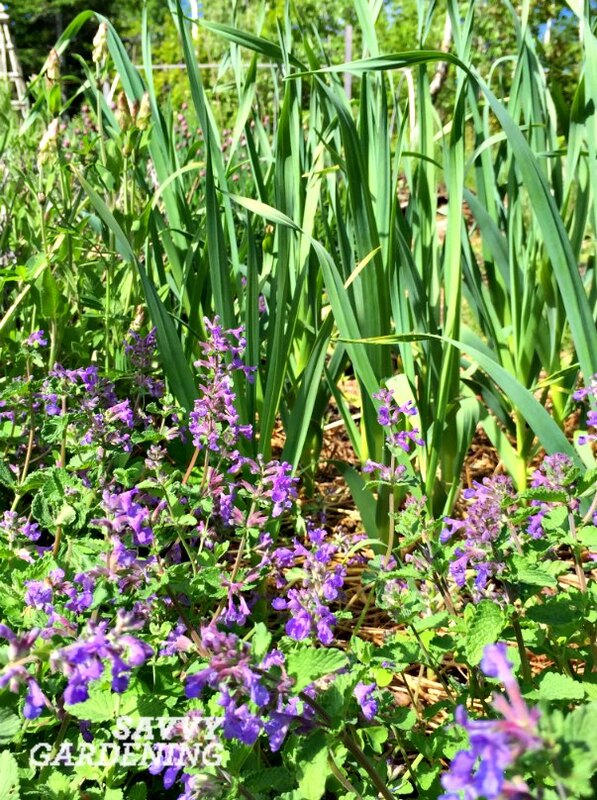 Garlic and catmint make perfect planting partners. 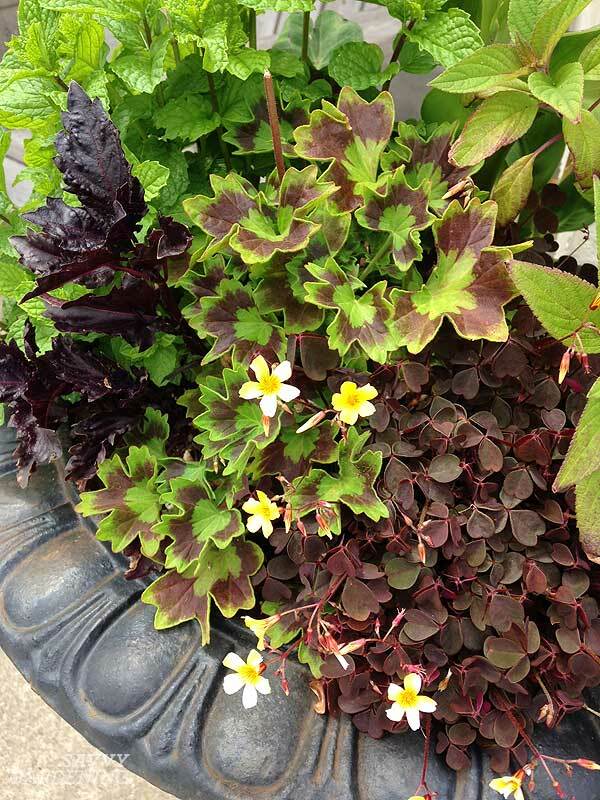 Tara says: “Each year, I love putting together containers filled with a vibrant mix of ornamentals. I have fun choosing flowers and foliage that go with the colour themes I’ve chosen. It was Paul Zammit, director of horticulture at the Toronto Botanical Garden, who first inspired me to start incorporating edibles into my ornamental pots. A few years ago, I was working on a video shoot with him for CanadianGardening.com, and I remember him talking about the texture of the ruffled parsley he added, and the fragrance of the rosemary if one happened to brush the pot on the way by. Since then, when I’m shopping for my containers, I still hit the annuals area, but then I veer over to edibles and herbs to see what I can use. One of my favourite garden BFFs, lemongrass, has become a common herb that I use in my pots in place of a spike or dracaena. It gives the arrangement height, plus I can walk out the door and grab a fragrant stalk for the Thai chicken curry dish I like to make. And colourful kale has come in handy for my fall arrangements in a pinch! ‘Purple Ruffles’ purple basil, mojito mint and pineapple sage frame and complement the greens and maroon-ish hues of the funky geranium foliage and the oxalis. Not shown is a yellow canna and some elephant ears my neighbour grew from seed. What are your favourite garden BFFs? Leave a comment or share a photo below. Almost all my edible plants are mixed in with my flower beds. I love experimenting. This year I have green beens and morning glories growing together. I’m not sure how it will turn out, but I’m having fun. Another book I like on the topic is Emily Tempe’s The Edible Landscape. Ooo..I might have to steal the morning glories and green beans combo idea from you, Bridget! Love that. You’ll have to let us know how it turns out. I grow cypress vine with my hops but haven’t tried combining flowering vines with veggies yet. I made a planter from 4 pieces of 2 X 12 @ 2 feet long, glued and screwed side to end so it came out square. I put four – four foot 2 X 2s, one in each corner, with an “H” brace at the top. The bottom is covered with a piece of plywood to hold the soil. I made saw notches at every 6 inches on the four uprights, then stretched mason’s twine around the saw cuts to make a trellis. There are four casters underneath so the planter can be turned to embrace the sun. I plant four parthenocarpic cucumber seeds on or about July 4th. I usually harvest 40 full-sized cukes before the killing frost. I could roll the planter indoors, top it with a grow light and grow cucumbers for Christmas gifts.